The cleanest shoes of Switzerland! 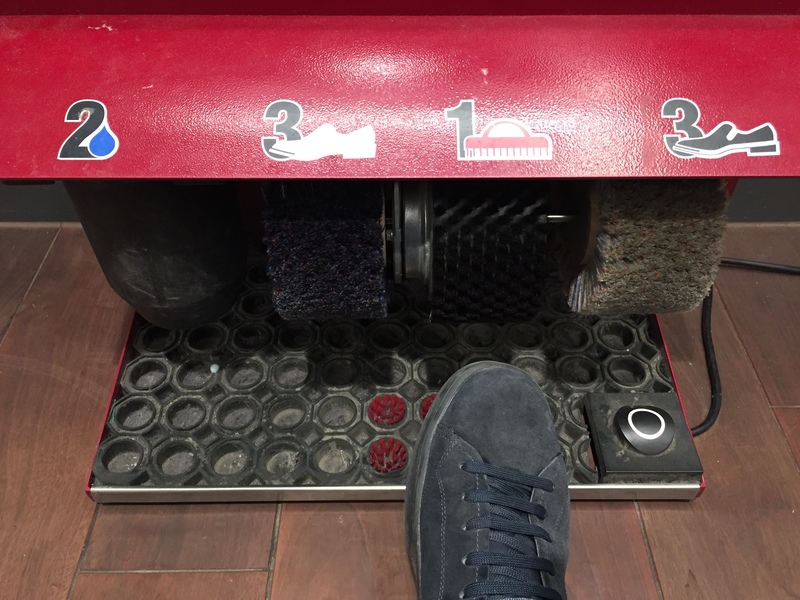 In Shoppi Tivoli, the biggest shopping mall in Switzerland (Spreitenbach, Canton Aargau), you can clean your shoes in a really perfect way! 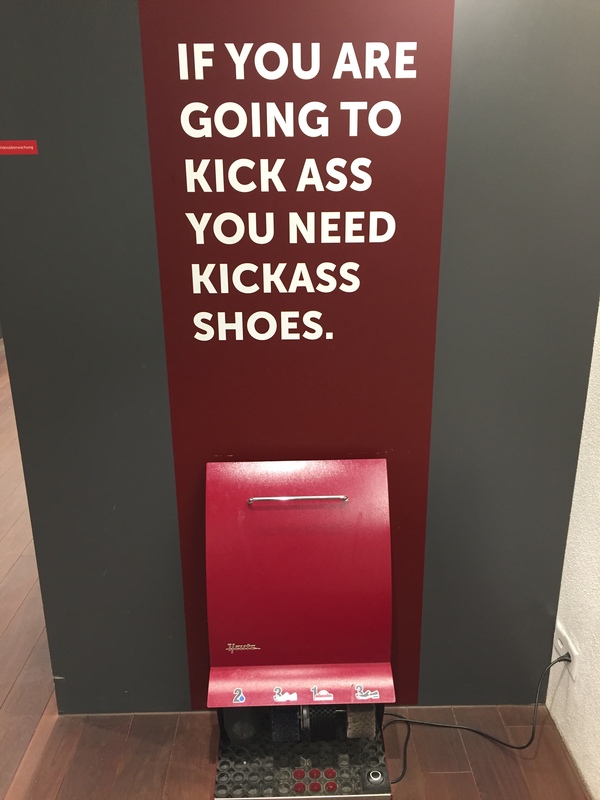 The sign next to the cleaning facilities reminds you that your shoes will get “special powers”! Russia 2018 – The Swiss team is there! The football World Cup 2018 in Russia is just entering the hot phase with the best 16 teams playing to run after the most wanted cup. Switzerland is still in and the football fever here between the Alps and the Rhine is still extremely high! Photo from huffingtonpost.it (source: Instagram). What a shame, little Switzerland! 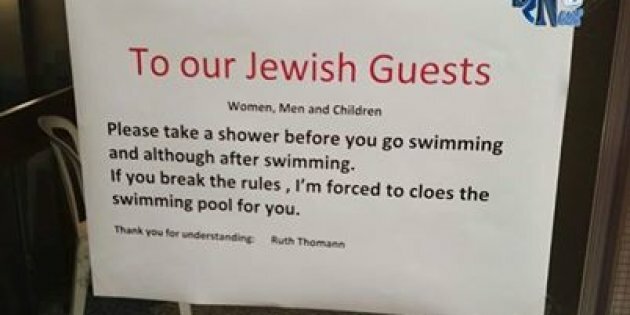 The embarrassing sign, written by the manager of an apartment hotel in Arosa, inviting the “Jewish” guests to take shower before and after the swimming pool, is travelling with the news all over the world! And it even provoked official complaints from Israel. The word “Jewish”, the specification of which Jewish persons are meant (really all, no distinction: women, men, children!) and the threatening order really sound discriminating, offensive, scary and racist. It is too easy and late now, Ms Hotel Manager, to say that you carelessly didn’t choose the right words for your scary sign. It would have been probably better just to say “sorry” to all the guests: Women, men, children… Jewish and not! “Gell”… this is quite a useless word. “Gell”… in Swiss or southern German this is just an interjection. Just to reinforce something which was said before. Something like “do you like it, DON’T YOU”? Or something which sounds like “RIGHT?”. 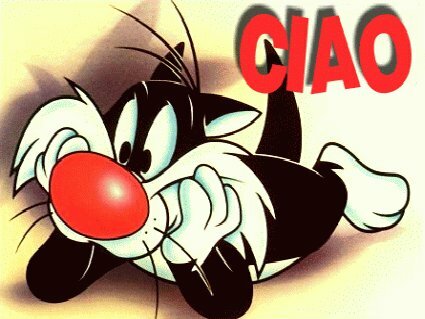 But when I hear such interjection after a salutation like “ciao” I start laughing: It is like confirming (to yourself, maybe!) that you greeted someone in a proper way! Why the hell do you need to confirm something after the word “ciao”, which is probably one of the most international and known all over the world? Please read my post! OK, GELL?! The Swiss are masters in a “special operation” which is quite annoying, especially in some cases when you need important and urgent information or you just would like to know something more on a specific subject. At work, or in a public office or in a shop or during a friendly conversation, you ask for something. They reply with a useless or vague answer. In this case it’s your right (and even your duty!) to ask again for further clarifications. At this point they apply the above mentioned “special operation”. The annoying, unrespectful, bloody sentence: “Sorry, I am overwhelmed with this question” or, originally “Ich bin überfragt” (it also sounds like: I am “over” asked). And this actually often means that you asked something too much, they do not know or they do not care and they want to close the conversation on that subject. 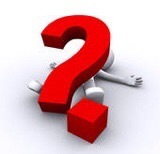 I find this expression very arrogant: If you ask for something they do not know, it seems that it is your fault of asking too much, not theirs of being ignorant! After this, what more to reply? Go to someone else (better foreigner) and ask the same or search by yourself in Internet. Sad but true. Now I better stop with this matter, which makes me very… “overwhelmed”! Today, during a course about safety, the trainer made me notice the following while speaking of psychological aspects. However, their kindness makes they speak quite indefinitely: normally no strong statement, but often everything dressed with “eigentlich” (= actually). And here comes the sport where a lot of Swiss actually excel: criticising and judging. The adverb “actually” is their best tool for this particular competition! 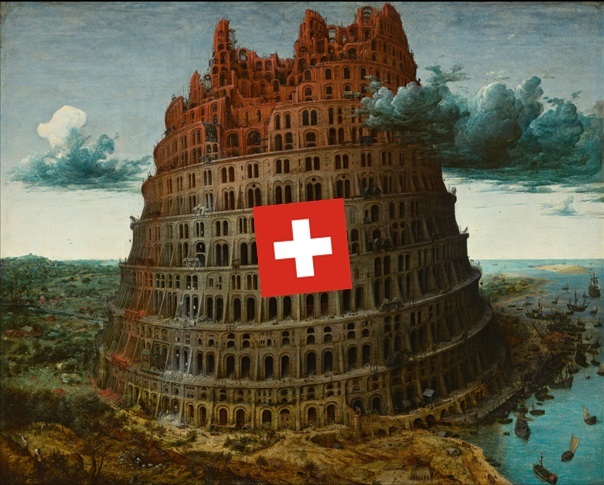 If there were ideal candidate countries to symbolically represent the Tower of Babel, Switzerland would be for sure one of them. 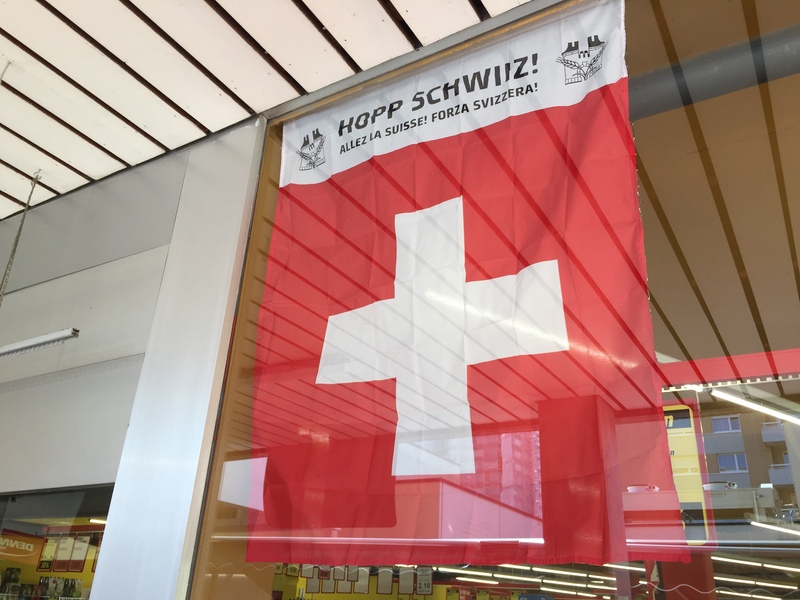 With 4 official languages and 24% foreigners from all over the world (Swiss statistics website: http://goo.gl/uzKyFc), you can imagine how many languages can be heard in the small Confederation! Apart from the Romansh, spoken in limited areas of Canton Graubunden (in the Southeast part of Switzerland), the other three official ones pretend to be well known European languages: German, French and Italian (in order of number of people speaking them). But they are actually not: they are just idioms and dialects resembling the languages of the three biggest countries founders of the European Union. That’s why, for example, in Switzerland they don’t speak “German” (Deutsch), but they proudly speak “Swiss German” (Schwiizerdütsch). And therefore, when they mean the proper German language, they have to refer to it as “high” German (Hochdeutsch)! Foreigners in a foreign country normally try to learn the local language to have a better integration. But in Switzerland, this is quite complicate: you can be the best student in your (high) German class, but then you go back to the reality hearing only Swiss German in the shops, on the bus, on the streets! Which is actually sounding like a totally different idiom. So different, that even a lot of Germans, at first, have difficulty to understand it! The typical and most friendly Swiss will approach you mostly in English (somehow they are even able to recognize your non-Swissness from your appearance)! And even if your German is not so bad, and you speak it out, they will go on in English…or say one or two words in their (high) German and then switch to English! Hell! I want to speak German! Yes, but my Swiss colleague (although it sounds strange) has to make quite an effort to speak high German, instead of roughly shouting his wild Swiss German. Renouncing to speak German, unless you have been here for years and you can manage to understand the Swiss version of the German language, you have then a lot of choices. Or maybe not so many as you might wish. In a group of friends or colleagues, there will often be the foreigner who cannot speak any German. Then everyone will switch to English…OK, actually to the Suissenglish, ve Italiano-english, ze Germanenglisch, se Frenschanglish, Croatianenglish, de E-Spanishenglish, etc. So many languages, so many foreigners, so many cultures! And if you are lucky, and if your language is not necessarily the Eskimo dialect spoken in Greenland, you will often find someone who can speak your language! Many times even the Swiss can manage some foreign idioms…actually at their best the bad words of each foreign idiom. This is also what is called “culture and knowledge of the populations of the world”, isn’t it?